The International Chamber of Commerce (ICC) 10th annual Global Survey shows that 60% of banks are moving towards greater digitalisation, though only 9% say technology solutions have so far increased efficiency. 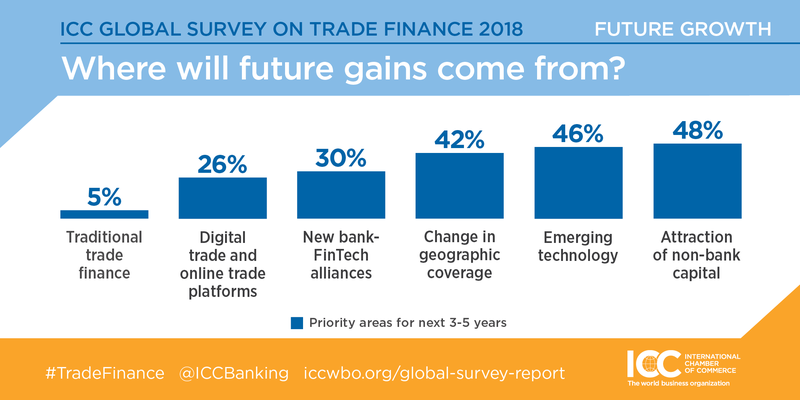 Over 60% of banks surveyed in the new ICC report—Global Trade: Securing Future Growth—reported to have implemented, or to be in the process of implementing, technology solutions to digitalise their trade finance operations. However, only 9% of banks reported that the solutions implemented have so far led to a reduction of time and costs in trade finance transactions. In what the report describes as a “reality check”, 30% of respondents say their banks remain 1-2 years away from implementing technology solutions while 7% say digitalisation is not on their agenda at all. A heavily paper-based industry with transactions worth over US$9 trillion in 2017, trade finance is often noted to be ripe for digital disruption. The multitude of documents and players (banks, customs authorities, shippers, and insurers, among others) involved in trade finance transactions, though, make it difficult for the industry to digitalise quickly. In the findings, 65% of respondents say that physical paper has to some extent been removed in the issuance/advising and settlement/financing of documentary transactions. A notable exception is the document verification process, where 52% of respondents say that paper has not been removed at all. Conducted annually, the ICC Global Survey report is the world’s most authoritative review of the trade finance industry, based on exclusive information from over 250 banks in more than 90 countries. The survey results are bolstered by contributions from an international array of leading voices on trade and finance, including experts from the World Bank, the Boston Consulting Group (BCG) and the World Trade Organization. A single trade finance transaction can require over 100 pages of documents, with an estimated four billion pages of documents currently circulating in documentary trade. According to BCG estimates, digitalisation could cut trade finance costs by up to US$6 billion in 3-5 years and boost banks’ trade finance revenues by 10%. The ICC Global Survey figures demonstrate that a majority of banks are moving towards greater digitalisation, recognising its potential gains, yet only a minority have so far seen technology solutions increase their operational efficiency. 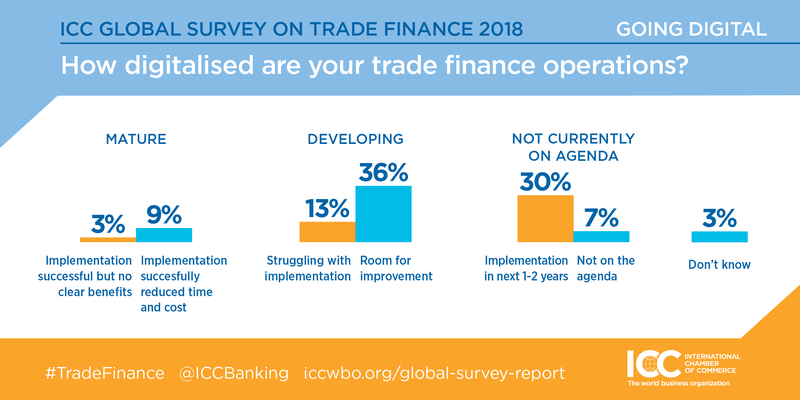 Among the many other Global Survey findings, responses show that banks are bullish on future trade finance growth trends. Nearly three quarters of banks presented an optimistic outlook for the next 12 months, with respondents headquartered in Africa and Asia Pacific the most positive, at 89% and 81% respectively. Looking ahead into the medium and longer term, only 5% of respondents consider traditional trade finance a strategic area of focus in the next 3-5 years. In contrast, 72% consider traditional trade finance a priority in the next 12 months. Nearly half of respondents agreed that attracting non-bank capital, leveraging emerging technologies such as blockchain and shifting geographical coverage were priority areas for the next 3-5 years. When asked what potential obstacles banks saw to their future growth prospects, respondents’ answers were stark. Regulation and compliance were named by 93% of respondents as potential obstacles while 87% pointed to complying with counter-terrorism and international sanctions regulation. The ICC Banking Commission has continuously advocated for banking regulation that avoids aggravating geographical disparities in trade finance coverage, specifically across poorer regions in Africa and South Asia. In 2017, following ICC engagement with the United Nations (UN) and national governments, the UN officially recognised the estimated US$1.5 trillion trade finance gap and pledged to carry out an official review of its underlying causes.